Home Letter of Credit Basics What does a non-documentary condition mean? What does non-documentary condition mean? Why it is important in letters of credit? What does the letter of credit rules say about the non-documentary conditions? Letter of credit has a unique characteristic which is described as a “documentary structure”. We can see the definition of the “documentary structure” in article 5 of the latest version of the letter of credit rules which is known as UCP 600. As I have explained above banks deal only with the documents in the letters of credit transactions, when determining whether or not a presentation is complying. This is a very straight forward and easy to understand situation. All documents must be issued or filled in English language. Things are getting complicated when a credit requires some conditions to be met, but does not specify a document relating to the condition. Each piece of textile is labeled with a tag showing the following: brand, origin, material construction. Shipment details including date and place of loading, name, age, nationality, IMO number of the vessel, value of the goods, gross and net weights of the goods and the ref.no of the l/c have been sent to our bank’s fax no:+31 3180 633 50 12 within 2 days after shipment date for information purposes. If a credit states a non-documentary condition, then things are getting complex not only for exporters or beneficiaries, but issuing and confirming banks as well. In order to understand the consequences of the non-documentary conditions in a letter of credit transaction we need to have a closer look at the rules and international standard banking practices. What Does the Letter of Credit Rules Say About the Non-documentary Conditions? Issuing banks and applicants should be very careful not to insert any non-documentary conditions to the letter of credit. They can achieve this by linking each condition to a document. Beneficiaries should read the credit very well in terms of non-documentary conditions. If they determine any non-documentary conditions in the credit, they should either have them deleted from the letter of credit or make sure that non-documentary conditions will not be creating a discrepancy during the presentation period. 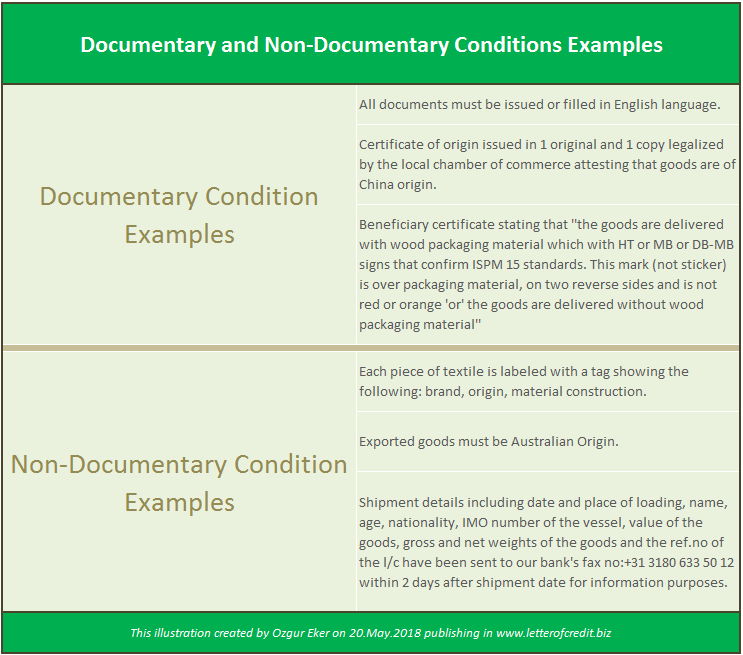 Remember a data contained in any stipulated document should not to be in conflict with the non‐documentary conditions. Otherwise banks determine that the presentation is not complying by referring related discrepancies. Next articleWhat is Business Identifier Code (BIC) and International Bank Account Number (IBAN)?